As condominium ownership increases in popularity, so does the need for competent, ethical management of condominium associations by their Directors and Officers. As fiduciaries of their associations entrusted with important responsibilities, Directors and Officers must have a clear understanding of their wide-ranging duties, including the duty of care and the duty of loyalty, so that they can manage effectively and avoid the liability they may incur for themselves and their associations in the conduct of these duties. This course outlines the duties of Directors and Officers, explains the potential liabilities they face when they fail to execute these duties competently and ethically, and instructs them in how to fulfill their obligations to condominium associations with proficiency and integrity (Discounts are available for Condominium Boards or Property Management Companies by calling us at 1-800-521-9667). To help individuals acting as Directors and Officers of incorporated Condominium Associations understand the basic laws, rules, regulations, and duties that govern conduct in their capacity as Directors and Officers in order to minimize the potential for liability resulting from their actions. identify the common mistakes that Condominium Association Directors and Officers must avoid to perform their duties successfully and not incur liability. This course (# 9626085) has been approved for 1.00 hour of continuing education credit in the areas of HR or ELECTIVES (ONLINE) by the Regulatory Council of Community Association Managers of the Florida Department of Business and Professional Regulation. 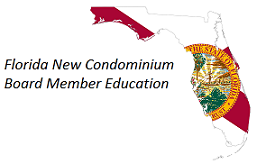 For more information about continuing education for Community Association Managers, visit the Regulatory Council's homepage.